Micah Elconin, food and beverage management consultant with RAIN Eugene, has a simple message for all Lane County food and beverage industry entrepreneurs. “The greater Eugene area is the perfect place to grow your company,” he says. And it doesn’t even matter what stage you’re at in the startup process. From concept to established business, Elconin says RAIN Eugene can help. Elconin explains his role at RAIN Eugene fulfills two major functions. “We activate the startup community among members and would-be members. We’re trying to make more electricity between those folks,” he adds. “We provide the tools and the knowledge to make stronger entrepreneurs,” he continues, but is quick to add it’s the startups are doing all the hard work. “We’re just there to coach, mentor and encourage,” he says. RAIN Eugene also advocates for startups on the state and regional level. “We put business startup at the forefront of conversation,” he continues. There are roughly 165 food and beverage manufacturers in Lane County, employing over 4,000 people and generating approximately 179 million in wages each year. And an emerging hotspot for this industry is just south of Eugene in Cottage Grove. “A number of the entrepreneurs in that area just so happen to be food and beverage related,” Elconin says, partially because there’s enough heavy-industrial and agricultural infrastructure in Cottage Grove to make it a perfect fit for aspiring food startups. And several such businesses have launched recently in south Lane County, such as Sanity Chocolate. 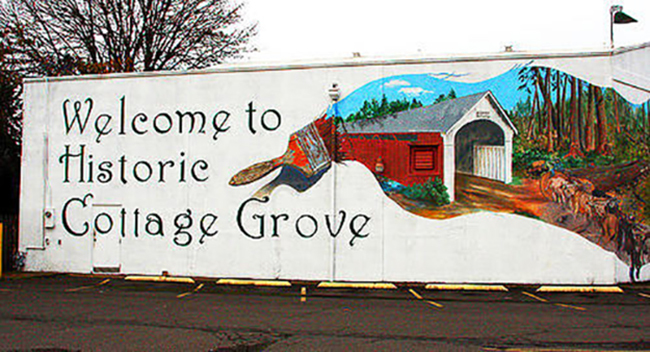 There’s also a Sustainable Cottage Grove, a food hub founded by Kim Johnson, who turned an auto garage into a functioning, food-safe kitchen that is attracting entrepreneurs from all over the state. Hot Winter Hot Sauce moved from Portland to Cottage Grove last year to work out of this space. “They’ve all received direct support from RAIN Eugene,” Elconin says. “We host a monthly coffee meetup where I connect with the entrepreneurs,” in the Cottage Grove area. “They come to me when they have specific questions,” he adds. One business founder who turned to support from RAIN Eugene early on is Joey Jaraczewski, founder of Sohr Performance + Nutrition. Originally from Arizona, he founded his company after completing an MBA at the University of Oregon to produce a plant-based protein shake. “We got to work,” he remembers. “The trouble with starting it needs to accelerate and accelerate fast,” Jaraczewski says. RAIN Eugene is working toward building Lane County food manufacturing infrastructure, and that infrastructure, Jaraczewski says, has a hand in attracting the capital needed to compete with established food and beverage powerhouses in California and elsewhere. And that’s where Elconin comes back into the picture. “I’m readily available to anyone and everyone,” he says. RAIN Eugene hosts open mentor hours at different locations across town, he adds. “Follow RAIN Eugene on social channels,” he continues, to find out ways to connect with RAIN and others in the local food and beverage industry. Elconin also hosts a quarterly event, Food Business Unpacked. “It’s a food and beverage industry night,” Elconin says, where startups mix with established professionals, connecting over—what else?— food and drink.